After you’ve solved your core authentication needs, what’s the next step in securing access to your critical resources? Your users are validated, but they still connect through a network from potentially vulnerable computers and mobile devices. So how do you identify which of these devices are compromised endpoints? In a 2017 SANS survey of IT professionals, 79% said hunting for compromised endpoints is “difficult or impossible.” Finding the right balance of security and user convenience is daunting, especially with BYOD and hosted applications added to the mix. The good news is that there are ways to make this easier, and this webinar will show you how. In a survey of 722 IT leaders by CIO Magazine, four out of five respondents were concerned about shadow IT projects lacking proper IT oversight in their organizations*. This concern is justified -- when users create "shadow IT" workarounds or avoid security processes altogether, it can leave organizations at risk. Security teams are learning that when you account for the human element, you can develop policies that users actually want to adopt. Join us for a discussion on how you can build a strong security culture by learning from user behavior research, and employing concepts like gamification to collaborate with your users. We’ve all seen the emails: someone shared a Google doc with us, our bank wants to verify our password, we’ve received an “important” attachment, you name it. Phishing is common. It’s common because it’s easy. Not only is phishing common, but it’s getting worse. There’s no “magic bullet” to eliminate phishing as a threat, so what can you do to mitigate your risk? Join Jordan Wright for a hands-on, method-focused deep dive into how you can reduce the threat posed by phishing. This will cover mitigation tactics at each stage of a phishing attempt, from before an email reaches the inbox to what you can do after a user clicks the phishing link. The security of Microsoft products has been the target of jokes in IT and infosec for years. While modern Microsoft software has significantly more advanced security properties, how fast are old devices and software going the way of Clippy? Are your Microsoft environments actually safe? What combinations of Microsoft products are IT admins and users really running, and what impact does that have on security? Join this presentation and learn the risks that Duo Security found by looking at more than one million Microsoft devices deployed in an enterprise environment. Industry data suggests 91% of doctors' use personal smartphones and tablets for patient care. These personal devices or BYOD enable doctors’ to reach patients anytime and from anywhere. However, IT does not control or manage these devices. Recently, Catholic Health Services of the Archdiocese of Philadelphia was fined $650,000 for a lost unencrypted and password unlocked iPhone with patient data. With Duo Trusted Access Platform, you can allow doctors to use their own smartphones and tablets while also ensuring secure access. According to Gartner, worldwide information security spending will reach $81.6 billion this year. Despite that, more than 80 percent of U.S. companies have been successfully hacked. Today’s attacks are bypassing traditional security defenses at an alarming rate. Social engineering methods, like phishing scams and other credential theft, may not be very sophisticated – but trends in corporate computing like BYOD, hybrid cloud environments, employees using public Wi-Fi, and have changed the landscape of security needs while broadening the potential attack vector. So what do you really need to protect your organization and stop cybercriminals? As organizations migrate to cloud-based Microsoft services like Office 365, many are concerned that traditional on-premises security infrastructures are now inadequate. The most common workloads requiring this new security approach as they move to public cloud platforms are email, Windows Desktop, and directory services. The Duo Labs research team has pinpointed some of the most significant reasons that medical records are among the easiest of any type of data to steal. For example, Duo Labs found that 76 percent of healthcare customers are running Windows 7, with 500+ known vulnerabilities to exploit. It only takes one outdated device for a hacker to exploit a known vulnerability. The real-world implication? A hacker gains access to patient records, including birthdates, social security numbers, medical, financial, and insurance information. Ninety-one percent of organizations in a recent TechValidate survey say they have seen phishing attacks on their organization in the past year. What’s more, 42% report more than 10 phishing attacks on their network in that time. What can be done to thwart this enormous threat and protect your data and users? Phishing simulation tools are a powerful way to see how many and which employees are prone to fall for phishing attacks. With this information in hand, you can determine how to train those who are susceptible to avoid these attempts, and provide the tools to protect against them. 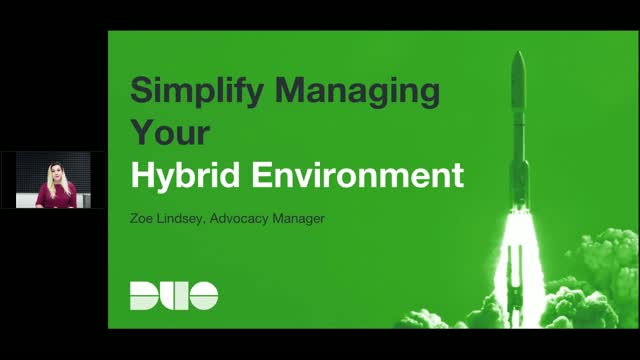 Hear from Steve Edwards, Duo’s Security Operations Manager, on his experience conducting internal phishing campaigns at education and tech organizations. In addition to interesting metrics and appropriate techniques that come from phishing simulations, Steve has 10 valuable lessons to share. Watch the recording for this webinar to learn several unexpected things about phishing, your company, and human psychology. Organizations with large, dispersed user populations face the challenge of protecting users in many different circumstances. When it comes to security, the human element is the most difficult to control, so having the right tools is essential. The Verizon 2016 DBIR reveals that 63% of breaches used weak, default or stolen credentials, and again they recommend two-factor authentication as one of the protective measures. But how can you get your privileged staff—not to mention others on campus—to accept something that creates a break in their workflow? Our mission is to protect your mission. At Duo, we combine security expertise with a user-centered philosophy to provide two-factor authentication, endpoint remediation and secure single sign-on tools for the modern era. It’s so simple and effective, you get the freedom to focus on your mission and leave protection to us. Duo Security makes security painless, so you can focus on what's important. Our scalable, cloud-based Trusted Access platform addresses security threats before they become a problem. We do this by verifying the identity of your users and the health of their devices before they connect to the apps you want them to access. With endpoint visibility, you get insight into all devices without installing an agent - identify and block outdated devices.